Are you sick of cowardly furniture? Are you looking for something to sit on that’s made of stronger stuff than the average chair? 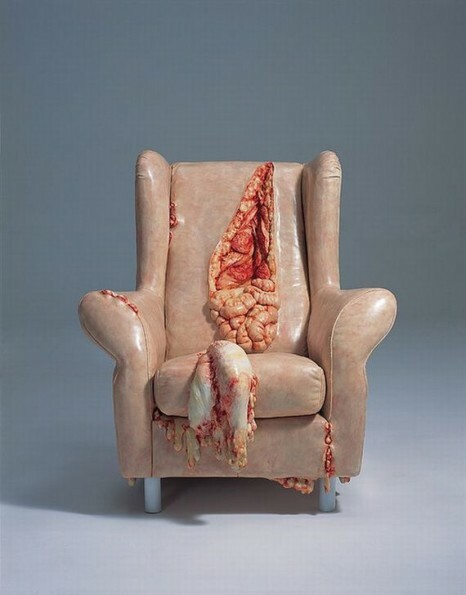 Then this chair’s for you; it’s got guts…literally. Not only does this chair have guts, but it has so many guts that they’re spilling out of the chair for all to see. The origins of this chair are something of a mystery, though it’s believed to be part of an art exhibit. Since no one seems to know specifically which exhibit housed this chair, we’re left to imagine the exhibit. I assume it was a complete living room set made from organs and body parts. What do you think?